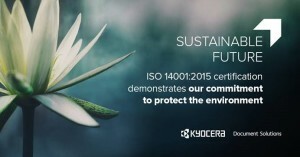 KYOCERA Document Solutions Europe, one of the world’s leading document solutions companies, has earned the ISO 14001:2015 certificate. The new certification demonstrates the organisation’s strong credentials in ensuring that environmental sustainability is central to its strategy, and is guided by the philosophy of KYOCERA’s founder, Dr. Kazuo Inamori. KYOCERA Document Solutions, headquartered in Osaka, Japan, is a leading manufacturer of document imaging solutions and document management systems, including colour and monochrome multifunctional products as well as printers and wide format devices. KYOCERA’s products are renowned for their unique long-life imaging components that provide greater reliability and less waste – resulting in a lower Total Cost of Ownership (TCO) over the life of the product. The KYOCERA Document Solutions portfolio does not stop at hardware. A full suite of business applications and consultative services allow customers to optimise and manage their document workflow, unleashing the full potential of their hardware investment. KYOCERA Document Solutions Inc. is a core company of KYOCERA Corporation, the world’s leading developer and manufacturer of advanced ceramics and associated products, including telecommunications equipment, semiconductor packages and electronic components. During the year ended March 31 2018, KYOCERA Corporation’s net sales totalled 1.42 trillion yen (approx. EUR 11.9 billion). OSAKA — Japanese electronics maker Kyocera will increase production capacity of photoreceptor drums by 150% through a 2.5 billion yen ($22.3 million) expansion of a Chinese plant, in hopes of capturing growing demand for copiers in emerging Asian economies. Photoreceptor drums, which allow copiers to print on paper, are a consumable that must be replaced and can affect the life span of the machine itself. Subsidiary Kyocera Document Solutions will add a new building to a plant in China’s Guangdong Province that currently also assembles finished copiers. Mass production at the new facility is slated to start in May. The entire production process will be automated, allowing the company to employ more than 90% fewer workers at the new facility and offset rising labor costs in China. The drums produced there will be used in slower models that print 20 to 35 sheets a minute. Kyocera’s drums use just one layer of photoreceptors instead of the typical three, making the parts more durable than the competition’s. More businesses in China and other emerging economies are using copiers in their offices. Kyocera aims to boost sales of slower models in such markets, while developing more sophisticated products for mature economies. High-end USB device server myUTN-2500 gets performance boost. New firmware 14.4.11 makes high-end USB device server myUTN-2500 faster than ever. The data transfer rate has significantly increased from 65 MB/s to 100 MB/s. If all three ports are occupied, then each port can reach a maximal transfer rate of 30 MB/s. For Windows, OS X/macOS and Linux operating systems. Download the new Firmware version 14.1.11 (myUTN-2500) and 14.4.10 (all other device and dongle servers) and our SEH UTN Manager 3.0.31 for free from our website. Hoofddorp, The Netherlands – February 15, 2017 – KYOCERA Document Solutions Inc., one of the world’s leading manufacturers of document imaging solutions and document management systems, is pleased to announce that four of its A4 multifunctional products (MFPs) and printers; namely the ECOSYS M5526cdw, P5026cdw, M2640idw and P2040dw; have won the “iF DESIGN AWARD 2017” sponsored by the International Forum Design GmbH (Germany). These products showcase excellence in compact design and low-noise operations; thereby allowing them to be set up in close proximity to the users at businesses such as retailers or distributors. KYOCERA received the “iF DESIGN AWARD 2017” due to the evaluation of its long-life design as a feature of product development, waste and printing cost reduction, as well as simple design and operability considering the user. The same four models have also won the “Good Design Award 2016” hosted by the Japan Institute for Design Promotion (JDP), a public interest incorporated foundation. Encouraged by the award, KYOCERA will continue to develop reliable devices that promise high-quality not only in performance but also in design and usability, thus contributing to building office environments where users can efficiently manage their document workflows. 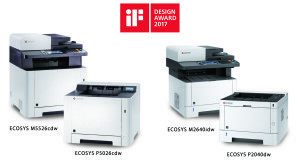 KYOCERA’s award-winning products are expected to be on show at the “iF DESIGN EXHIBITION” in Hamburg, Germany (Exhibition Part 1) between March 11 – June 2017. Every year, iF International Forum Design GmbH organizes one of the world’s most celebrated and valued design competitions: the iF DESIGN AWARD. Recognised as a symbol of design excellence around the world, the iF DESIGN AWARD welcomes over 5,500 submissions from 59 countries this year. KYOCERA Document Solutions, headquartered in Osaka, Japan, is a leading manufacturer of document imaging solutions and document management systems, including colour and monochrome multifunctional products as well as printers and wide format devices. Kyocera’s products are renowned for their unique long-life imaging components that provide greater reliability and less waste – resulting in a lower Total Cost of Ownership (TCO) over the life of the product. “THERE IS AN OLD SAYING IN OUR INDUSTRY: A SALES REPRESENTATIVE SELLS THE FIRST MACHINE TO THE CUSTOMER, A SERVICE TECHNICIAN SELLS ALL THE MACHINES THAT FOLLOW”, SAYS NORBERT WOLTER, KYOCERA DOCUMENT SOLUTIONS EUROPE’S CSSD SENIOR GENERAL MANAGER. 2017 is the last year at KYOCERA Document Solutions for Norbert Wolter as Senior General Manager before his retirement. This year also marks a memorable one for the company as KYOCERA celebrates the 10thanniversary of the annual KYOCERA Document Solutions European Service Awards. Having dedicated his tenure at KYOCERA to this pivotal division, Norbert has helped create a center of excellence in celebration of KYOCERA Service Technicians’ remarkable skills in the repair and maintenance of KYOCERA’s products. This annual (and industry only), competition assists in uniting all service technicians across the EMEA region as they strive to win the coveted title “KYOCERA European Service Award Winner”. The idea was born 15 years ago out of the close and trustful relationship between KYOCERA Document Solutions Germany (KDDE) and its dealership companies when technicians were assigned the crucial task of maintaining KYOCERA’s hardware devices. Soon after, as Norbert puts it, “they were not only fixing problems, but establishing themselves as KYOCERA’s quality guardians, assuring customers they have made the right choice when opting for a KYOCERA device,” explains Norbert. With the 10th anniversary of the Service Awards on the horizon, Norbert closes the chapter on a decade of palpable and positive change within the industry through his personal initiative. “The creation of the Service Award, to see it grow and become so successful, is something that I will take with me and be proud of. The moment we announce who the Service Award winner is and see the expression of surprise on the face of the winner is such a precious moment. I only wish for every technician to participate and strive towards achieving this recognition,” Norbert explains. The future of KYOCERA’s technicians is more challenging, yet more rewarding and exciting: “Our future machines will continue to feature more functions and possibilities. It will be essential for the technician to predict a failure before it really happens. As a result, the role of technicians will change fundamentally, but we are readily preparing them and are excited to meet those challenges”. South Africa has been outstanding in the Kyocera Global Service Awards in years gone by, having produced top 3 positions for the last 3 years in the European finals. This year we’ve already have 45* entries booked and 28* have completed the online questionnaire in their quest to be the best. Kyocera’s new printers and MFPs have received the award in recognition of their simple and compact design, as well as for their usability—including low-noise operations and an easy-to-change toner container. Consideration was given to the devices’ design, taking into account how these A4 MFPs and entry models are likely to be used in the office. Additionally, Kyocera successfully achieved low-noise operations, as these products are highly likely to be used in office areas with limited space. To suit office layouts, flexible installation is possible thanks to standard wireless LAN functionality. The products also come with a remote management tool with ample functionality, including batch settings for multiple MFPs and printers, reducing the time spent on remote device administration. The Good Design Award is a comprehensive design-promotion system that picks good design out of a variety of unfolding phenomena, and aims to enrich our lives, industries, and society as a whole by highlighting and celebrating these works. It is hosted by the Japan Institute for Design Promotion, a public interest incorporated foundation. It’s precursor, the Good Design Selection System (or G Mark System), was founded in 1957 by the Ministry of International Trade and Industry (the current Ministry of Economy, Trade and Industry), and has been engaged in this work for about 60 years. Submissions come from a wide range of fields, and roughly 1200 designs are recognized every year. Over 59 years, around 43,000 designs have been recognized by the awards. Recipients of a Good Design Award are granted use of the G Mark symbol, which has been an emblem of good design for over half a century. Note: This e-mail is confidential. If you are not the intended recipient, please do not disclose or use the information contained in it. If you have received this mail in error, please inform us immediately by return email and delete the document. Thank you for your understanding and co-operation. If you do not want to receive this newsletter in the future, you can easily unsubscribe here. LOS ANGELES–(BUSINESS WIRE)–Laserfiche—a leading provider in enterprise content management solutions—has been recognized for the eighth consecutive year by Gartner, Inc. in the 2016 Magic Quadrant for Enterprise Content Management (ECM) based on its completeness of vision and ability to execute. The Laserfiche suite of ECM products are designed to work together seamlessly to provide an exceptional user experience. Adding to core ECM capabilities, Laserfiche Forms provides a robust Business Process Library—included at no additional cost—that accelerates deployments with a set of packaged, industry-specific processes, web forms and wizard-driven integrations. Laserfiche Discussions facilitates team communication on processes with intuitive features—including team discussions, messaging and document linking—using an integrated social community platform. “Laserfiche will help organizations deliver business results faster—whether that means saving millions of dollars, driving business innovation or complying with industry regulations on information security and records management,” said Phelps. Founded in 1849, Ducommun Incorporated provides engineering and manufacturing services to the aerospace, defense, and other industries through a wide spectrum of electronic and structural applications. The company is an established supplier of critical components and assemblies for commercial aircraft and military and space vehicles as well as for the energy market, medical field, and industrial automation. It operates through two primary business units – Ducommun AeroStructures (DAS) and Ducommun LaBarge Technologies (DLT). Additional information can be found at www.ducommun.com. 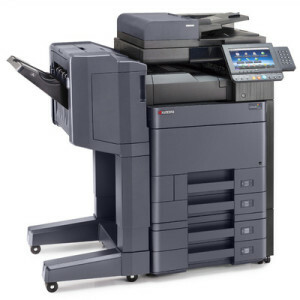 KYOCERA Document Solutions South Africa, one of the country’s leading document solutions companies, has launched five new colour and five new monochrome A3 multifunctional printers that help organisations to streamline document management and digitise their business processes. The three new product ranges are the TASKalfa 6052ci colour devices, the monochrome TASKalfa 6002i series and the monochrome TASKalfa 3511i series. The new multifunctional printers have print speeds ranging from 25ppm up to 60ppm and will also include features to better manage maintenance and replacement of consumables. The new TASKalfa 6052ci offers a combination of outstanding colour quality, high speeds and high-capacity document processing. The superb colour quality is thanks to their newly developed toner with a wider colour gamut and their 1,200 x 1,200 dpi print resolution, which is offered at full engine speed. It supports productivity with flexible paper-handling options and fast, economical and reliable printing. Users can also print on special paper sizes such as SRA3 (full-bleed edge-to-edge A3), banner paper, tab divider sheets and paper of up to 300 gsm. An innovative toner technology with thinner and more homogenous coating enables improved and far more even light reflection, as well as improved colour quality. The new TASKalfa 6052ci series also impresses with significantly sharper images due to high resolution of 1,200 x 1,200 dpi, 2 bit depth (4,800 x 1,200 dpi). For companies with demanding image quality needs, or particularly complex workflows, four of the new colour MFPs offer an optional Fiery print controller. The Fiery controller increases the quality of prints and improves RIP (raster image processor) speed, as well as taking document and print order management to a new level. With output and scan speeds of up to 60 ppm and 180 ppm respectively, the TASKalfa 6002i is a workhorse that keeps productivity flowing in medium and large sized workgroups. It handles heavy workloads with ease thanks to flexible, high-capacity finishing options and a paper capacity of up to 7,150 sheets. Its digital document management functions are quickly accessible via an intuitive, large colour touch panel. Sensitive documents are protected by a range of enhanced security functions. KYOCERA’s new TASKalfa 6052ci and 6002i series both feature a toner lock, preventing users from exchanging toners unless it is really time to do so. This has a positive impact on the TCO and the eco-friendliness of the new products. KYOCERA was awarded a BLI (Buyers Lab) Pick of Summer 2016 Award for innovation for its reusable black toner feature. Companies can use an expired black toner bottle as a waste container, reducing waste generated, storage requirements for supplies, as well as downtime and service costs. Through its managed document services and solutions, KYOCERA Document Solutions South Africa can help companies get rid of the clutter by fully optimising their document management fleet and by using the functionality of the new TASKalfa series to streamline their document workflow. The MFPs offer dual scan document processors of up to 270 originals – when combined with one of KYOCERA’s capturing solutions, can help organisations to complete their digital transformation. Two of KYOCERA’s new MFPs, the TASKalfa 3011i and 3511i, have been designed to fulfil the needs of smaller organisations such as branch or satellite offices and small schools or institutes. These monochrome A3 MFPs offer the same user interface and security level as the TASKalfa 6052ci and 6002i series. The TASKalfa 3011i, 3511i and 2552ci are launching in October 2016, with the remaining range launching towards the end of the year.